Background: Melasma is a common benign acquired pigmentary dermatosis due to a disorder in the function of the melanogenesis process. Although several treatments are currently used, it remains a great challenge. Aim: The aim of this study is to compare the efficacy of intradermal injected tranexamic acid (TA) vs hydroquinone (HQ) cream in the treatment of melasma. Materials and methods: In this prospective split face controlled clinical trial, 49 patients were randomly divided into two groups of A (24 persons) and B (25 persons). 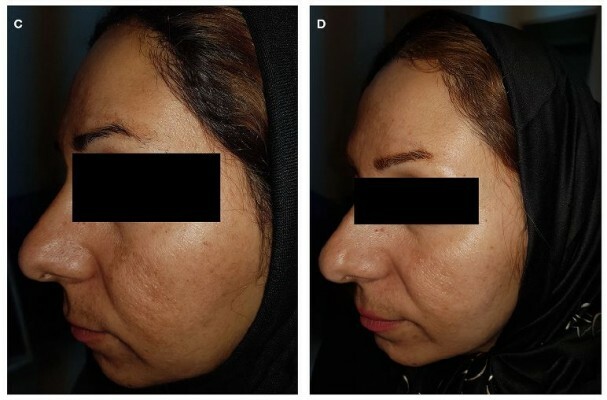 Patients received TA intradermal injections every 2 weeks on the right side of the face with a concentration of 4 mg/mL in group A and a concentration of 10 mg/mL in group B. The left side in both groups was treated twice daily with topical 4% HQ cream, and treatment continued for 12 weeks in both groups. Melasma Area and Severity Index (MASI) scores were measured for each side of the face at baseline and at weeks 4, 8, 12, and 24. SPSS, version 22, P<0.05, was used for data analysis. Results: Forty-one patients (21 in group A and 20 in group B) completed the study. The MASI score in the 12th week significantly decreased compared to the baseline for group A, group B, and HQ cream. However, no statistically significant difference was observed between the MASI score of patients in groups A and B. Also, the comparison of TA at the concentration of 4 mg/mL compared to the 4% HQ cream showed that the MASI scores in the eighth week (P=0.02) and the 12th week (P=0.02) were significantly less in the HQ group. However, no significant difference was observed between the MASI score changes in Group B (10 mg/mL) and the 4% HQ group. Also, patients in group A had higher satisfaction than patients in group B (P=0.001). Conclusion: Injection of TA intradermally can be an effective treatment for melasma.